Jenna and I decided to put our heads together and come up with the absolute best possible cake to make for her daddy’s birthday. It didn’t take long for her to spot it. This was not negotiable. So, I got it. 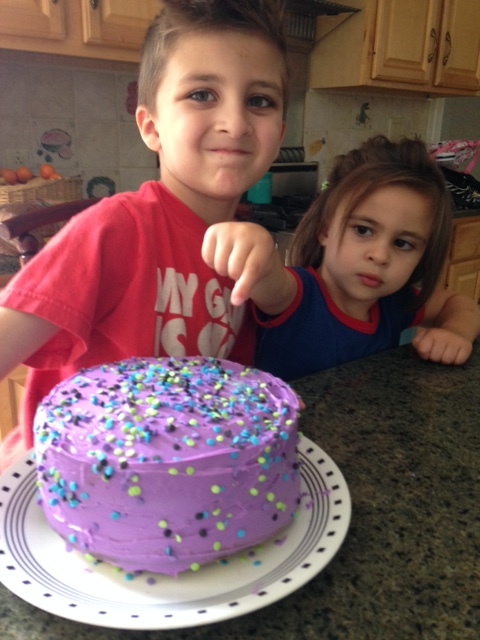 Along with purple Funfetti frosting because we don’t do anything halfway in this family. 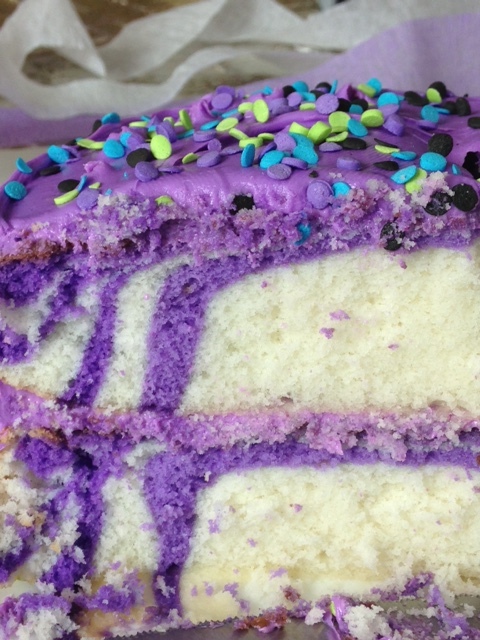 Ready to tackle the intricacies of a layer cake with purple stripes, we jumped right in. So after following the directions and adding eggs, water, oil, blah, blah, blah…. 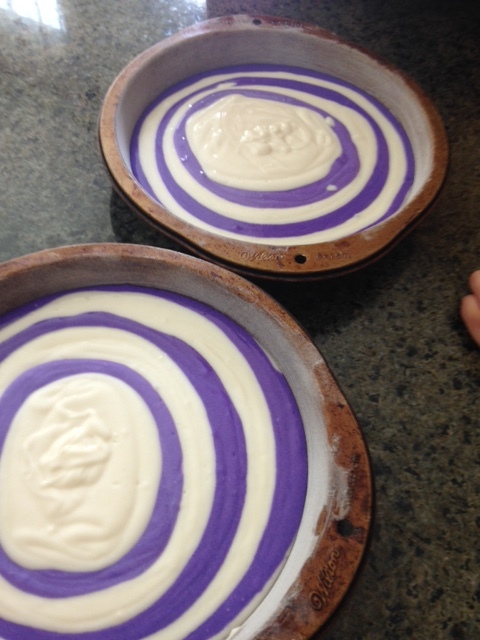 we divided the batter and added purple dye to one bowl. 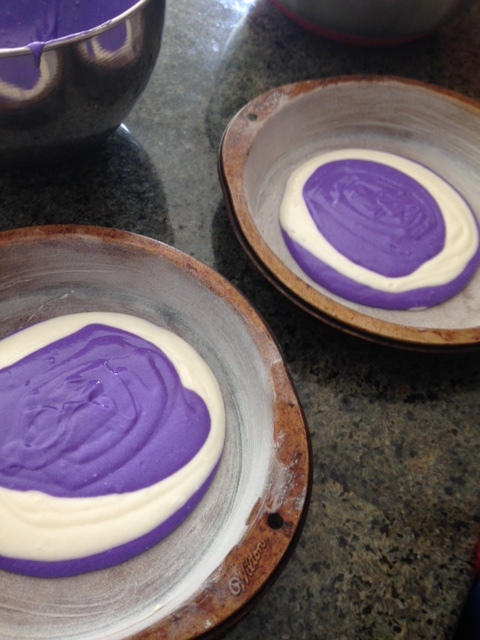 You then take 1/2 to 1/3 cup of each color and alternate pouring it into the center of each pan… letting it spread out before adding the next scoop. This is how you make the stripes. Kids thought it was great fun. 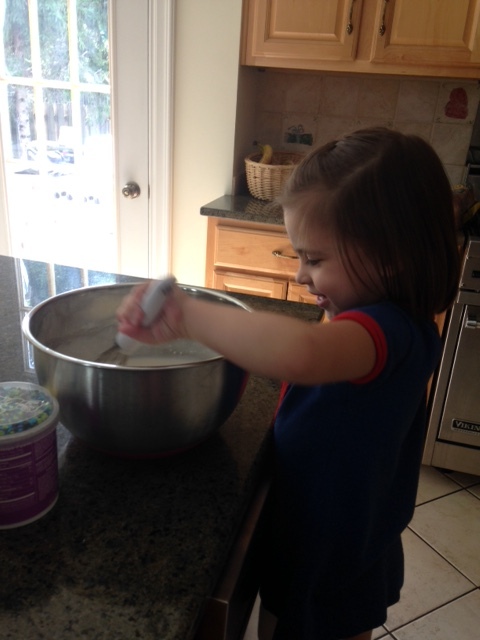 We bake. We cool. We dump out the cakes and are ready to stack and frost. 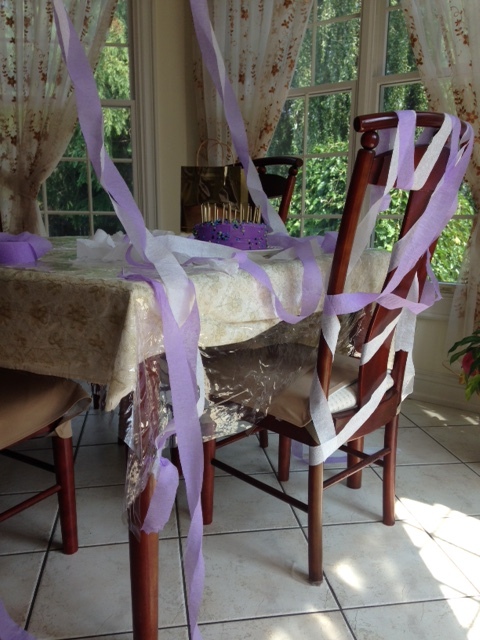 Now, I am not a master cake decorator… but my mom was/is. She took classes and everything. I know how to properly stack layers and frost a cake because of her. However, we were in no mood for the massive amount of wasted time that goes into doing things….properly. Besides, it’s really not as fun that way. 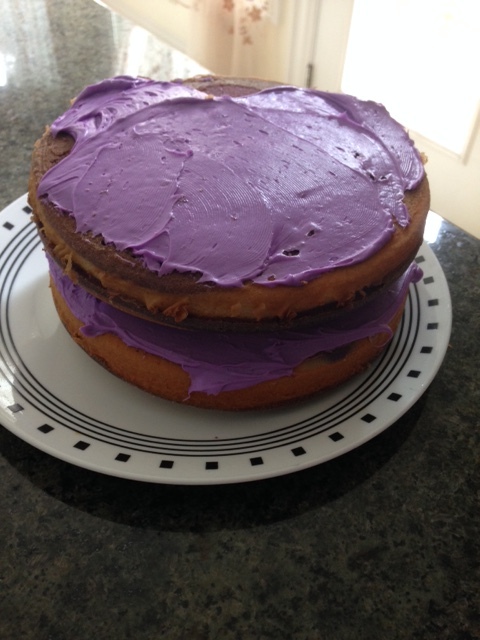 Now, you can’t see just how big the gaps around the center of the cake were since we didn’t level the layers nicely before throwing them together. 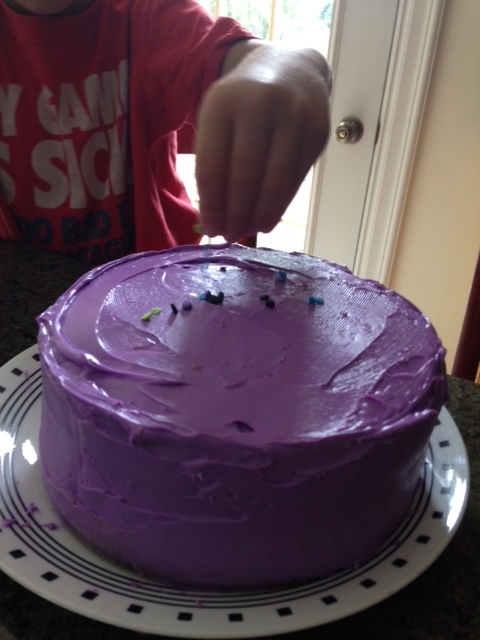 The purple funfetti frosting was used as more of a spackle in this situation, and it worked beautifully. All the gaps were filled in and I didn’t have to open an extra container. 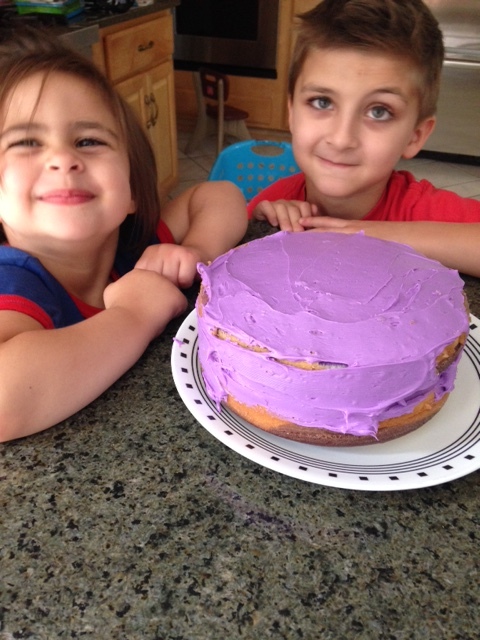 Jenna is pretty thrilled with herself, for having the genius idea of making a purple cake. This is her realizing her dream. Sammy is a bit speculative at this point. Not fully taken with the idea yet, but willing to see it through. 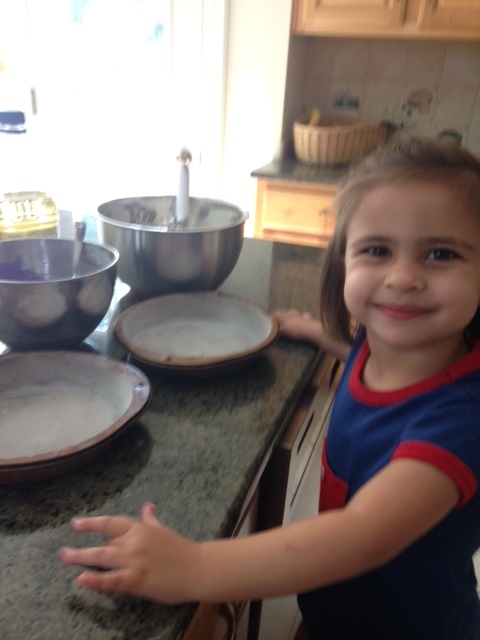 Now… at this point the cake was done, but we had to wait until Daddy got home from his trip to celebrate his birthday. So….. the next day, as he is upstairs being very slow as usual getting himself ready for the day……. 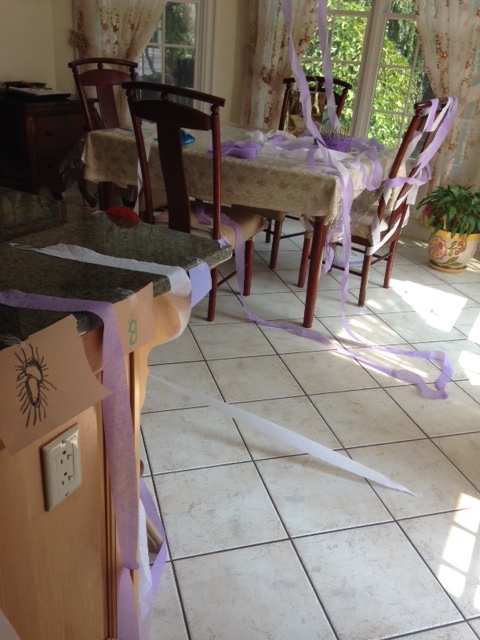 the kids were “decorating” for him. Still in the purple theme. Ladies and gentlemen…. without further ado, I give you…..
Good choice, Jenna. He didn’t see that one coming. 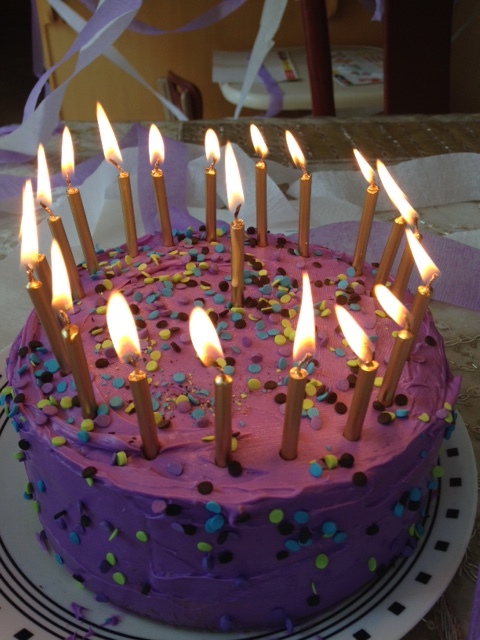 Best, most delicious, purple-striped birthday cake ever. 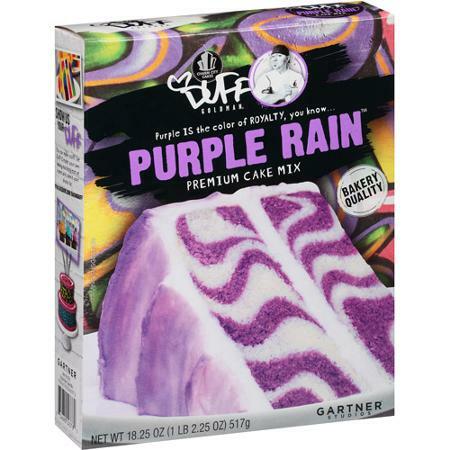 This entry was posted in birthday, humor, kids and tagged birthday, birthday cake, birthday surprise, funfetti, making cake with kids, purple cake. Bookmark the permalink.